25% + unemployment in Spain?! Now I know why. They have the same lawyer mentality as US. As TD Jakes would say "Somebody slap her up the side of her head!" This woman just ruined a precious piece of art. She should be in jail by now. Whoever owns the painting should be reimbursed by the woman who destroyed it. 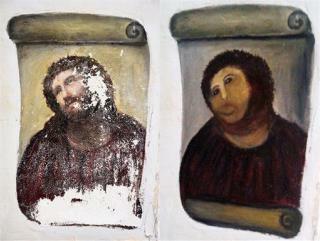 Don't give her another shot at it; hire a reputable painter and cut your losses (there have to be many in Spain). My 3yo could do a better representation of this master piece.